This recipe taken from "My Catholic Kitchen" was originally an Ina Garten recipe. She is a TV host, cookbook author and recipe developer, former gourmet food store owner and former Policy Analyst for the White House. The original recipe called for the cook to fry the eggplant in a frying pan in batches. Instead all the eggplants were put under a broiler and it worked fine. If you want to do it the frying pan method, get the recipe here. 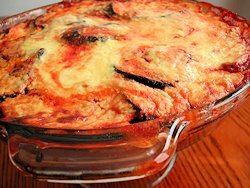 In a gratin dish (I used a pie plate) place a layer of eggplant slices, then sprinkle with Parmesan, salt and pepper, spoon 1/2 of the marinara sauce. Next, add a second layer of eggplant, more salt and pepper, half the ricotta mixture, and finally 1 tablespoon of grated Parmesan on top.